A series of corporate finance posts on launching, growing and ultimately selling a technology company. Topics include cap structures, equity plans, financing, corporate partnering, board matters and how to achieve a successful exit. My most recent series of blogs dealt with stock options and vesting. If handing out equity is the fun part of the job, then looking for investment capital is the no fun part. Don’t believe anyone who says they like raising money, and doubly don’t believe anyone who says it’s easy. It’s a difficult, humbling exercise and often the differentiator separating out entrepreneurs born for start-up world and the pretenders who aren’t. And like anything you do, you need a plan. Too many entrepreneurs come flying out of the gate approaching the wrong class of investors with the wrong pitch at the wrong stage of development of their company. The result? Wasted time, wasted effort and sometimes even damaged credibility. And of course, no money. Remember, raising money is sales. You need a strategy and you need to be selling to your potential customers – in this case investors – what they want to buy, when they want to buy what you are selling. and finally the less risk-tolerant investors such as private equity firms, the public markets and lenders. There are all kinds of exceptions to this and much overlap as well. For example, angels may invest both early with friends and family and later with VCs, and lenders may come in at various stages. The initial round of investment often comes from friends and family and the founders themselves. This is often called “love” or “blood money”, and might be referred to as a seed or pre-seed round. This investor class will be approached right at company formation, and usually before the product has even been built or revenues generated. The amount raised at this stage is usually in the hundreds of thousands of dollars, not millions, and is the first equity investment into the company. These investors invest based on their relationship with the founders of the company and often there is very little due diligence. (And in many cases mistakes are made with valuation and terms, more on this in later blogs). The next couple of rounds of investment might come from angel investors, wealthy individuals who invest on their own behalf. These rounds are referred to as angel rounds but might also be called a pre-seed or seed round. 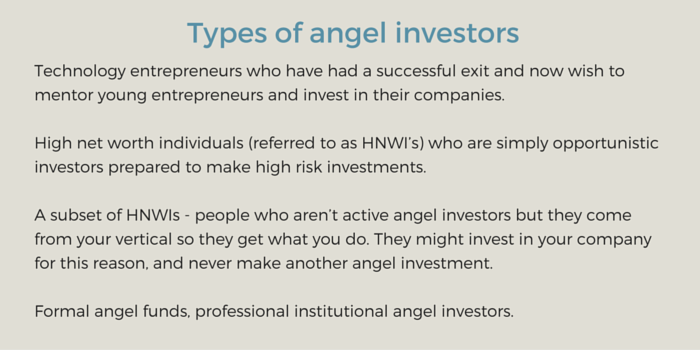 Angels will often invest at the same time as friends and family, and also at a very early (pre-product, pre-revenue) stage. Angel rounds are often in the hundreds of thousands, but “super-angels” will invest, individually, in the millions. As the company evolves, additional capital will come from venture capitalists (VCs) – referred to as a VC round and often described as an A, B, C round, and so on. These terms come from the naming of the class of preferred shares they acquire in their investment, and merely indicates which money came in first, second, etc. These are professional institutional investors, managed by people who are managing other people’s money (“OPM”). They are high risk investors who are demanding on terms. They will sometimes invest pre-product and pre-revenue (at least early stage VCs will), although they would prefer to see at least a prototype or minimum viable product and some sales traction. VC rounds are in the millions and tens of millions, and later rounds can be north of a hundred million. These investors are looking for companies that are past the R&D stage and preferably profitable or at least break even. You will hear many say, don’t talk to us until you have three years of EBITDA. Critical to the success in securing financing is approaching the right class of investor at the right time with the right pitch. In upcoming posts I will go through each of these categories in detail and discuss what they want to see, how to approach them, and the mistakes you should avoid. Next up: Get prepared with the materials every company needs before looking for money. David practiced corporate finance law for 20 years representing numerous BC-based technology companies before retiring to co-found a venture capital fund where he was a partner and portfolio manager for ten years. He now provides corporate finance/M&A advice to a portfolio of early stage companies with a view to growing them to the point they are ready to exit, and then leading that process.